Have you ever wished that you were some kind of a superhero, with the ability to bend the element of fire to your very will? I bet you’re thinking about it now! Well, in this article I’m going to show you how to use Photoshop to transform yourself into a digital superhero! 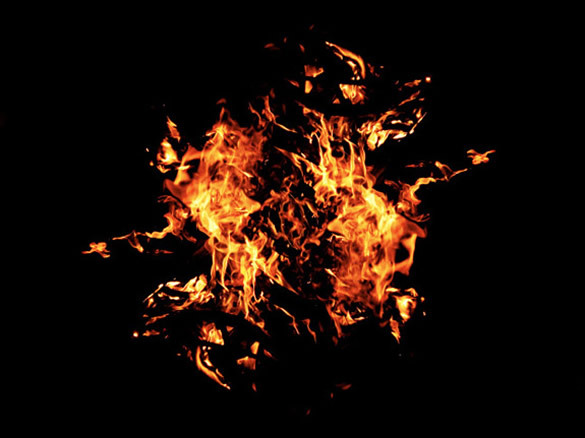 We’re going to take a simple image of a small and muted campfire and transform it into a bold and powerful ring of flames! Then we’ll integrate that ring into a cool looking poster. Before we start, however, I need to give a little credit where such credit is due. Part of this tutorial is inspired by an article from the September 2009 issue of Photoshop User, entitled “3D Fire Logo”, in which author Corey Barker outlines the steps for creating a really cool looking fiery logo, with an unjoined ring of fire as one of its key features. You can actually download a PDF version of the article here. Corey’s article focuses mostly on the 3D tools in Photoshop, though. 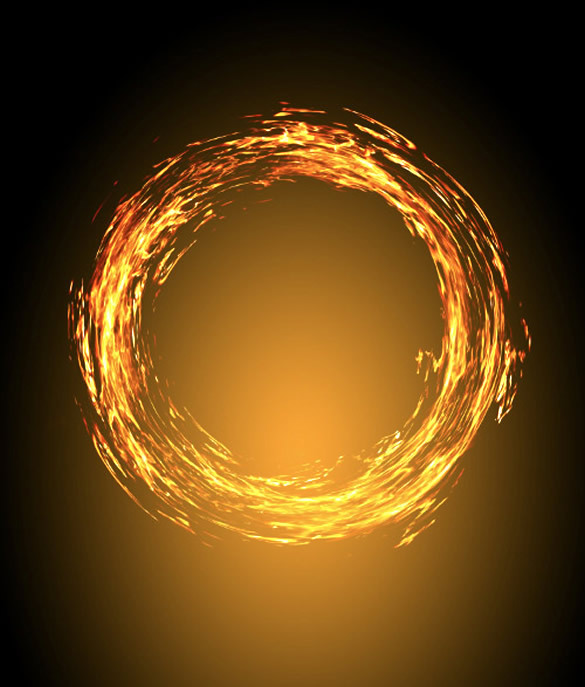 The techniques we are going to be looking at will actually take quite a different approach, focusing on augmenting and increasing the flames, while creating a seamless and unbroken ring of fire. Before we do anything, we need to get our hands on some flameage. The key for this project is to find a good image of fire against a black background. 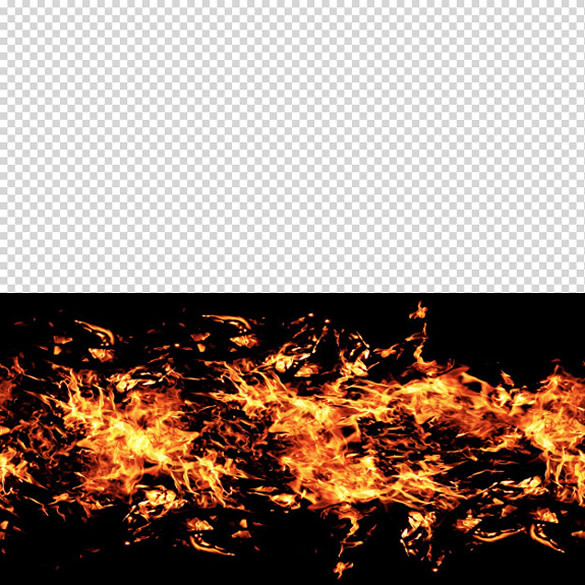 We also don’t want any of the flames to be extending beyond the edges of the image. This photograph of a campfire from Dreamstime will be pretty much perfect. Start by opening up the image itself. It’s a nice little bit of flame, but we can still see a little bit of the wood that is being burned. To fix this, we are going to adjust the brightness and contrast. You can use either the normal adjustment option or an adjustment layer. Either way, set the brightness to a value of -18 and the contrast to a value of +18. This will darken the shadows, effectively eliminating some of the unwanted parts of the image. Next, we need to brighten this fire up a bit. The flames aren’t nearly as strong as we would like them to be, but we can fix that really easily. Unlock the background and duplicate the layer. Then set the blending mode of the new layer to screen and duplicate this new layer again. The image should now look something like this. Okay, now we’re going to go ahead and flatten the image. This is destructive editing, which is not something that I regularly endorse, but it will work for us in this circumstance. If you’re worried about needing to go back and make changes, you can always save a new document for each step. After having increased the vibrancy of the flames, some other parts of the image have also been made more visible. 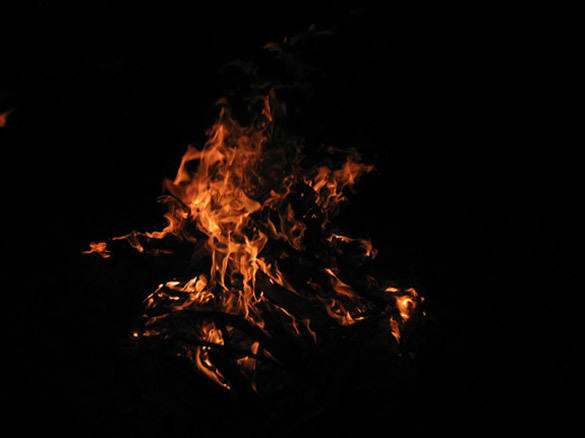 For example, there is a tiny tongue of flame at the left edge of the image. To get ride of this, select a large, soft brush and set the foreground colour to black. Then simply paint over this bit of flame. Now, flatten the image again and unlock the background. Duplicate the layer and set the blending mode to screen (are we seeing some kind of pattern developing here?). This will really brighten up the image, so that the contrast becomes almost too strong. Don’t worry, we’re not going to leave the new layer like this. 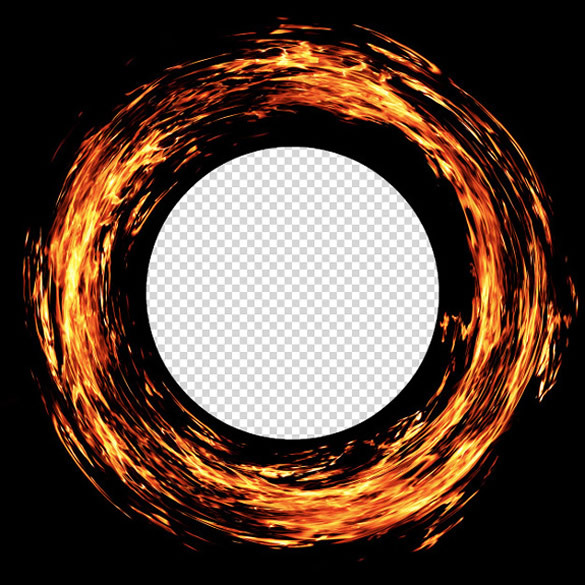 This will give us an perfect, seamless edges on the left and the right sides of the image, which will come in handy in the later steps, when we actually create our ring of fire. When you are satisfied with the positioning of your flames, flatten the image. 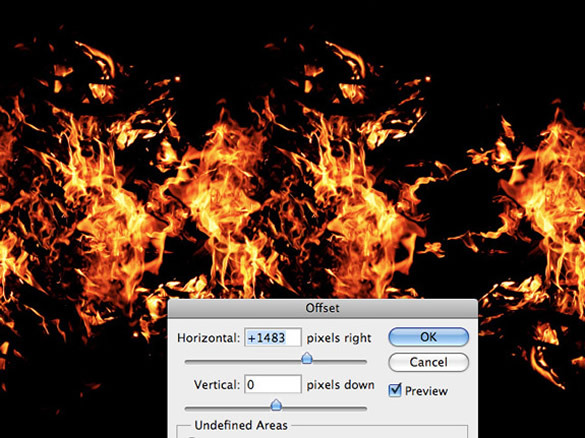 Be sure to flatten and not just merge the layers, since we want to effectively crop off any residual pixels that may exist outside of the canvas, due to the rotation of the flames. Once it’s flattened, immediately unlock the background to transform it back into a workable layer. 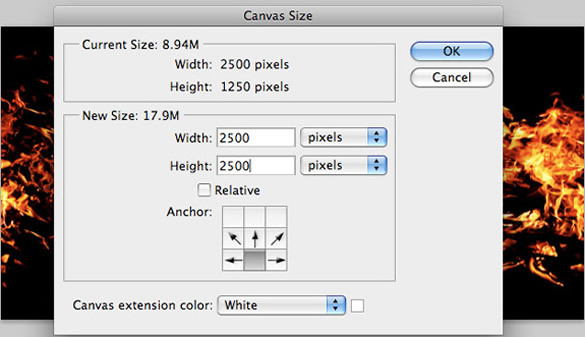 Now, we want to resize the canvas. Select Image -> Resize from the menu. If the Constrain Proportions option is selected, be sure to deselect it. We actually want to change the dimensions of the image a bit. Set the width to an even 2500 and the height to 1250 (or exactly 50% of the width). Next, we are going to increase the overall size of the canvas itself. 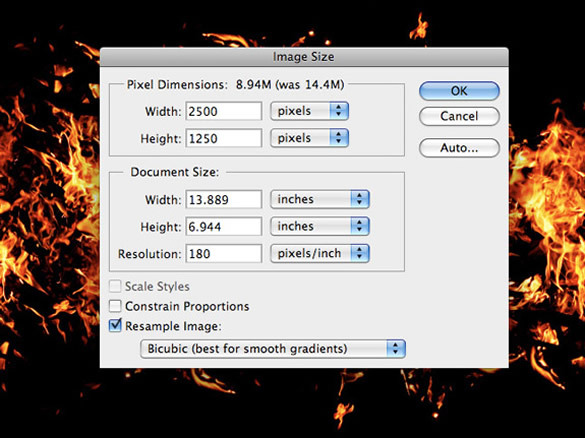 Select Image -> Canvas Size from the menu. In the dialogue box, set the anchor to the bottom and increase the height to 2500. We are now ready to create our ring of fire. Select Filters -> Distort -> Polar Coordinates from the menu. Be sure to have the Rectangular to Polar option selected. This will take our band of fire and wrap it around the centre point of the image itself, creating a bold ring of flame! Now, simply apply the filter. 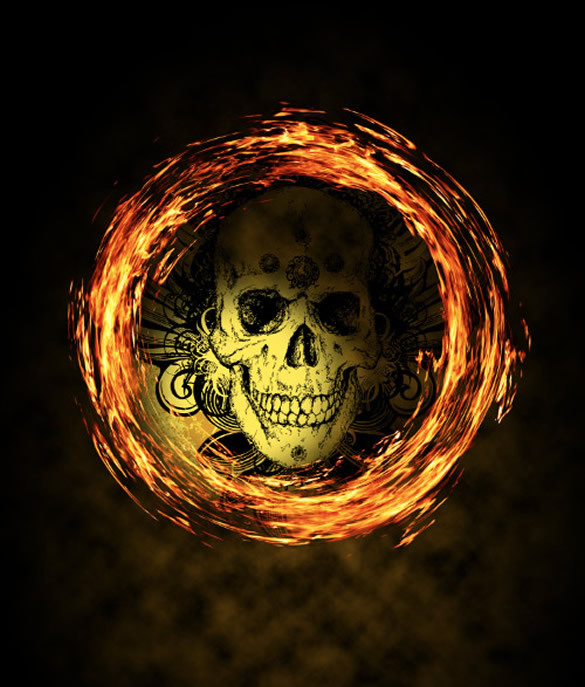 Create a new layer behind the ring of flame, and fill it with black. Then merge the two layers together. Note: If you look at the top part of the ring of fire, you may see a slight seam, where to two ends of our original band come together. To fix this, simple select the Clone Stamp and a small, soft brush. Use this tool to very carefully brush away the obvious seam. 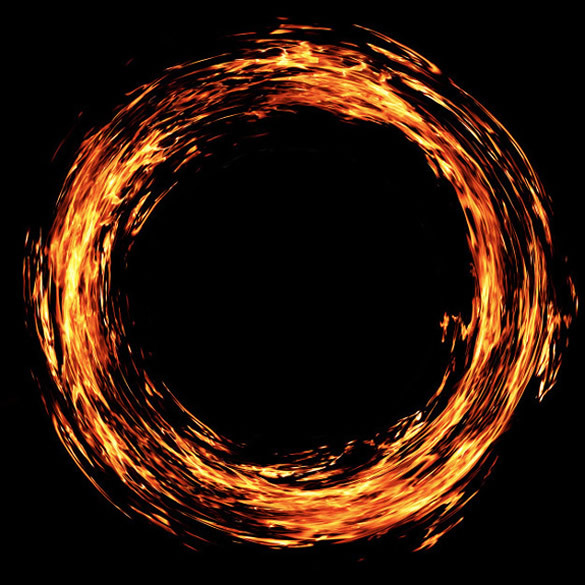 A ring of fire is pretty sweet, but it probably won’t do much good on it’s own. 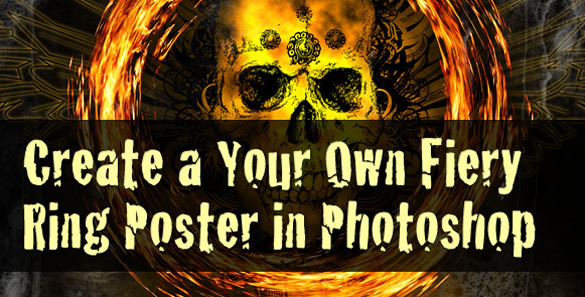 So, in the next three steps we are going build a quick’n’dirty poster design around the ring of fire. Next, set your foreground colour to a medium grey, create a new layer and choose Filter -> Render -> Clouds from the menu. This will create a cloudy texture in the layer, which you will now want to set to multiply. Head on out to Vecteezy and pick up this awesome vector skull illustration by chadlonious. 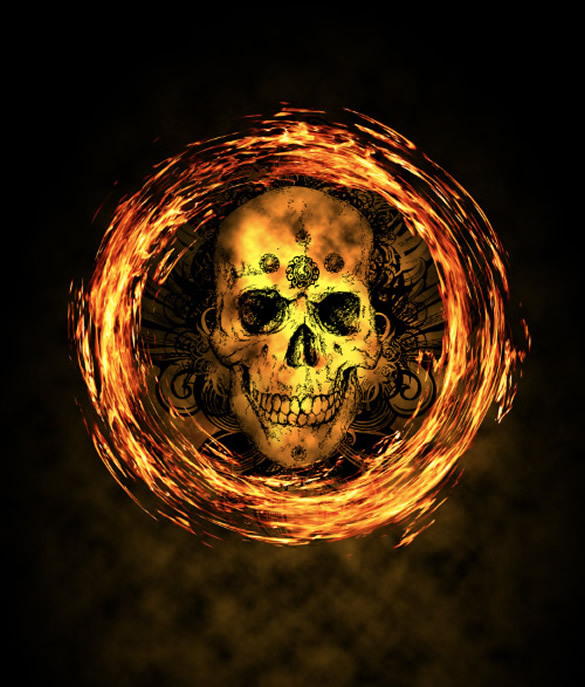 Place the image into the Photoshop file resizing and positioning it so that the skull is in the middle of the fiery ring, and directly beneath it in the Layers Palette. Then, set the blending mode for the vector to multiply. Set the blending mode to overlay. Repeat this several times to build up a solid glow effect, which will allow the dark lines of the skull to really stand out. Next, return to Vecteezy and pick up this totally awesome pack of tribal designs by SadMonkeyDesign. Pull out one of the designs and place it into your Photoshop document. I would typically do this by opening the EPS in illustrator, selecting the design that I want and copying it to the clipboard. Then, I would paste it into Photoshop as a new Smart Object. Using Layer Styles, give the tribal design a soft yellowish outer glow and a slightly larger orange drop shadow, with distance set to 0 and the blending mode set to screen. Finish up the graphics part with a layer or two of grunge, using whatever brushes you have at your disposal. This will give the design a nice, distressed look! The last thing that we’ll do is add a bit of type. I created a fictitious band name – having decided to make this a band poster – called Night of Nights (if there is a band named that, I’m sorry I don’t know them). I chose to use the Cracked font for the band name, and simply replicated the same glow effect from the tribal design. I also created the name “The Flames We Fear” as the title for an album or tour, or something to that effect. For that text I used the Oregon LDO font and set the colour to a lighter yellow. So there you have it. 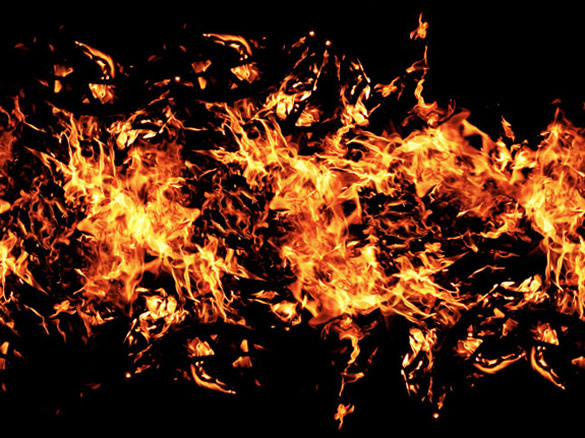 Now you too can be a superhero, by using Photoshop to magnify and bend the flames to your will! I hope you enjoyed this tutorial. 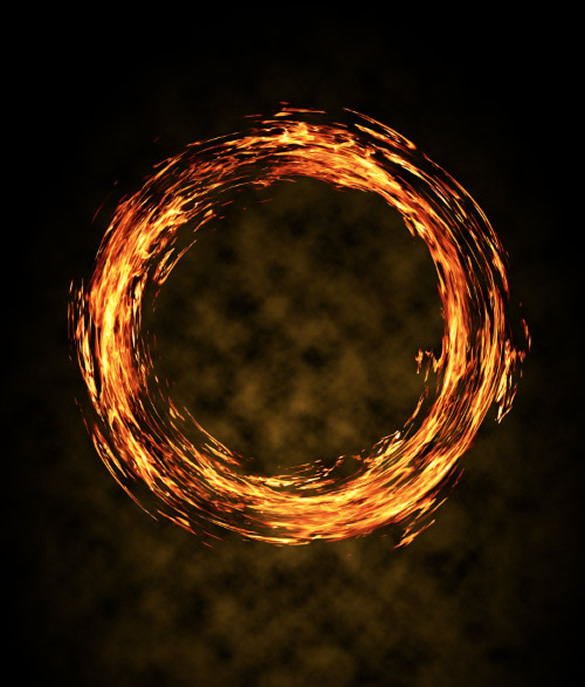 In some ways, the last few steps are really just extra, but I wanted to complete the effect, and not leave you hanging with nothing more than the fiery ring itself. I think the finished design is pretty cool and does a pretty good job of integrating itself around the flames. I hope you think so too. See ya next time! Matt Ward is a digital artist who lances freely under the moniker of Echo Enduring Media, and specializes in graphics design, illustration and writing. You can follow him on Twitter. Thanks for the tutorial – this will def come in handy for a similar project that is in the pipeline – Thanks again! Great Tutorial. I have done according to this tutorial, But still its not looking as your design. Anyway i will again do it many times until i get like your design. Thanx for the great work. great post, and awesome tutorial. Superb effects of fiery ring. thanks for the link back and for using my skull!